Those of you who follow us on Twitter may have guessed that Tim and I have been tinkering with Ramps for iPad ever since Ramps 1.1 debuted back in April. We’ve taken that time to insure that the iPad experience isn’t a mere port, but a definitive version of the game. Another question we get asked a lot is whether or not Ramps for iPad will be a separate app, or a universal update. We wrestled with this distinction for quite some time, with both options having pros and cons, but we think you’ll be happy with our decision. Ramps 1.2 is a free update for existing players, available now on the iOS App Store! 40 marvelous new HD levels exclusively for the iPad… 240 levels in all now! An epic new iPad title screen chock-full of delightful surprises to uncover! Full iCloud support with game save and score auto-sync! New Game Center Achievements! Who doesn’t like bragging rights? Major stability and design improvements. Shiny new buttons! If you dig this update, consider spreading the holiday cheer by rating the app or gifting it to a friend! Tim and I would like to extend a sincere and heartfelt thank-you to those of you who have played and supported our game. We hope you have a wonderful holiday season, we’ll see you in 2012! As I continue pumping out design for Tim to breath to life, it helps to take moments to absorb all the beauty and wonder produced by the indie game community for quick hits of marvelous inspiration. Here’s a fine example. Fez is a platformer currently in the home stretch of development by Polytron and featured prominently in the upcoming Indie Game: The Movie documentary (of which I am a Kickstarter supporter). The game looks charming, evocative and just plain stunning. I’m a big fan of similar perspective shifts in Super Paper Mario, but this looks even more engaging and atmospheric. 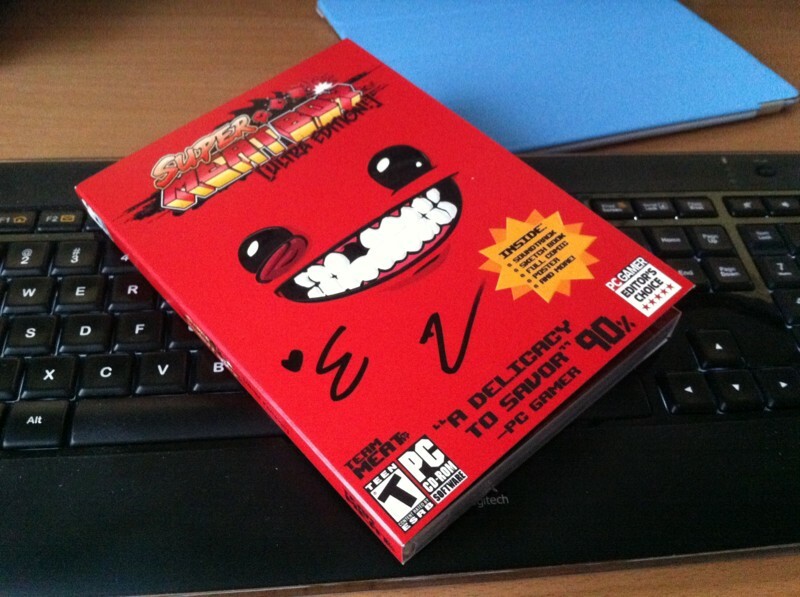 Since Fez isn’t out yet, I was relieved to receive my copy of the Super Meat Boy Ultra Edition in the mail, signed by Edmund McMillen and Tommy Refenes. I bought a wired Xbox 360 controller just to enjoy playing in my office between stretches of Ramps tomfoolery. My last great 2-D platforming experience was New Super Mario Bros. on the Nintendo DS, so it’s been thrilling to routinely lose myself in such a merciless-yet-rewarding adventure. If you’re a fan of Meat Boy, you’ll dig League of Evil for iPhone and iPod Touch. It’s the only virtual button platformer I’ve been able to play for any length of time. Seriously, how did Ravenous Games make the controls so responsive? A bargain at $1.99! Get it, play it, love it. Speaking of touch platformers, I took 1-bit Ninja for a spin as well. I love the Game Boy aesthetic and the 3-D rotation feature. I applaud them for exploring a new and radical way to streamline touch controls without relying on the aforementioned virtual buttons. That said, I cannot seem to find my zen with the forward-only movement. Is it just my expectation of platformers in general that’s betraying my ability to control this game with confidence? I was digging through some of my old files from college and stumbled upon my earliest experiments with ball and ramp physics in Flash. These were created on August 25 and 26 respectively back in 2006 as part of a homework assignment for Dan Chapman’s Interactive Motion Scripting course at the Art Institute of Portland. We were working through chapters 9 and 10 of the ActionScript 2 edition of Keith Peters’ Foundation ActionScript Animation. The first draft of my homework used assets directly from the examples in the book. You could click, drag and “let go” of the balls to throw them, but there was no interaction with the randomly generated ramps (referred to simply as “lines” in my original script). It’s fun to look back to the beginnings of this fun project. It shows me the value (and fun) of building things just for the heck of it. It also makes me very, very glad to have a collaborator now. Physics are hard to troubleshoot by yourself! Thanks to everyone who came to see our presentation at WebVisions today! Our slide deck is embedded below. We’ll be sure to post any video, photos, reactions, etc. later if they’re available. If you have feedback for us or questions you didn’t get answered, let us know in the comments or on Twitter. Ramps is a finalist in the mobile category of the WebVisionary Awards, but we have some stiff competition! If you’re in Portland, we hope to see you there.